The latest Grand Prix tournament takes place in Elista 13th-29th December 2008. Participate 14 chess players: Gashimov Vugar, Eljanov Pavel, Jakovenko Dmitry, Wang Yue, Radjabov Teimour, Cheparinov Ivan, Mamedyarov Shakhriyar, Grischuk Alexander, Inarkiev Ernesto, Alekseev Evgeny, Bacrot Etienne, Kasimdzhanov Rustam, Leko Peter, Akopian Vladimir. Veselin Topalo won a Super GM Tournament which took place in Nanjing, China 10th - 22nd December 2008. Six players participated in a double round robin event. They were: Veselin Topalov g BUL 2791, Vassily Ivanchuk g UKR 2786, Levon Aronian g ARM 2757, Movsesian Sergei g 2732 SVK, Peter Svidler g 2727, Bu Xiangzhi g CHN 2714. It was the strongest tournament ever held in China. Nadezhda Kosintseva is the Champion of Russia-2008.Women's superfinal of Russian Championship took place in Moscow 4th-14th December. In the round robin tournament participate 10 chess players: Tatjana Kosintseva (2513), Natalja Pogonina (2474), Nazhda Kosintseva (2468), Ekaterina Korbut (2459), Evgenija Ovod (2429), Tatjana Shadrina (2429), Marina Romanjko (2398), Tatjana Stepovaja (2386), Anastasija Bodnaruk (2381), Valentina Gunina (2381). The prize fund is 1 700 000 rubles (about $60000). The VI International junior tournament "Young Stars of the World" in Vania Somov memory took place 15th-27th November in Kirishi (Saint-Petersburg region). The juniors under 18 y.o took part in the event. Armenia and Georgia became the winners of The Olympiad which took place in Dresden 12th-25th November. The top teams were: Russia (Kramnik, Svidler, Grischuk, Morozevich, Jakovenko), Ukraine (Ivanchuk, Karjakin, Eljanov, Yefimenko, Volokitin), China (Wang Yue, Bu Xiangzhi, Ni Hua, Wang Hao, Li Chao), Azerbajdzhan (Radjabov, Mamedyarov, Gashimov, Guseinov, Mamedov), Hungary (Leko, Polgar, Almashi, Balog, Berkesh), Bulgaria (Topalov, Cheparinov, Georgiev, Delchev, Iotov), France (Bacro, Vashje-Lagrav, Fressine, Tkachiev, Maze), Israel (Gelfand, Avrukh, Roiz, Postny, Rodshtein), Armenia (Aronian, Akopian, Sargissian, Petrosian, Minasian), USA (Kamsky, Nakamura, Onischuk, Shulman, Akobian). Top women teams: Russia (Kosteniuk, T.Kosintseva, NKosintseva, Korbut, Pogonina), Ukraine (Lahno, Zhukova, Ushenina, Gaponenko, Zdebskaia), China (Hou Yifan, Zhao Xue, Shen Yang, Ju Wenjun, Tan Chzhunyi), Georgia (Chiburdanidze, Dzagnidze, Dzhvakhishvili, Lomineishvili, Khukhashvili), France (Sebag, Skripchenko, Collas, Milliet, Leconte), Armenia (Danielian, Mkrtchian, Aginian, Galoian, Andriasian), USA (Krush, Zatonskikh, Goletiani, Rohonyan, Abrahamian). Svetlana Matveeva from Moscow and Nikita Vitiugov from Saint-Petersburg became the winners of The men and women final tournaments of the Cup of Russia which took place in Serpukhov, form men 4th-17th November, for women 4th-15th November. In men's tournament played 48 participants. 16 raiting favorits started from the second stage: Evgeny Najer 2682 RUS, Alexander Moiseenko 2678 UKR, Vladimir Malakhov 2675 RUS, Artiom Timofeev 2670 RUS, Boris Grachev 2653 RUS, Alexander Lastin 2651 RUS, Boris Savchenko 2648 RUS, Evgeny Bareev 2647 RUS, Vadim Zvjaginsev 2646 RUS, Evgeny Tomashevsky 2646 RUS Pavel Tregubov 2646 RUS, Konstantin Sakaev 2640 RUS, Nikita Vitiugov 2638 RUS, Farrukh Amonatov 2634 TJK, Sergey Volkov 2632 RUS, Alexnader Galkin 2624 RUS. In women's tournament take part 24 participants. 8 top rated players are: Ekaterina Kovalevskaya 2439 RUS, Svetlana Matveeva 2411 RUS, Tatiana Stepovaya 2386 RUS, Anastasiya Bodnaruk 2381 RUS, Valentina Gunina 2381 RUS, Irina Turova 2381 RUS, Yulia Demina 2357 RUS, Irina Vasilevich 2354 RUS. Ivan Demidov of Moscow, Russia finished second in The World Series of Poker (WSOP) which came to an end on the 9th of November. The WSOP is largest and most prestigious of all poker tournaments around the world. Leinier Dominguez became the winner of the IV World Blitz Championship, which took place in Almaty Kazakhstan 7th - 8th November 2008. Time control: 5 minutes per game. The prize-winning fund is 350 000 Swiss francs. Players: Alexander Morozevich 2787 RUS, Vassily Ivanchuk 2786 UKR, Teimur Radjabov 2752 AZE, Shakhriyar Mamedyarov 2731 AZE, Gata Kamsky 2729 USA, Peter Svidler 2727 RUS, Alexander Grischuk 2719 RUS, Boris Gelfand 2719 ISR, Leinier Dominguez 2719 CUB, Judit Polgar 2711 HUN, Sergey Rublevsky 2702 RUS, Krishnan Sasikiran 2692 IND, Vladislav Tkachiev 2664 FRA, Murtas Kazhgaleyev 2640 KAZ, Rafael Vaganian 2590 ARM, Amin Bassem 2560 EGY. Peter Svidler is 5 time champion of Russia! He won the additional match-tournament in rapid chess against Evgeny Alekseev and Dmitry Jakovenko which took place 28th October. The format was 6 games (double-round robin) of 15 minutes + 10 secunds. The result of this match-tournament was: 1 Svidler - 3.0, Jakovenko - 2.5, Alekseev - 0.5. The Russian Championship SuperFinal took place in Moscow 2nd - 16th October. In the robin round tournament took part 12 grandmasters: Alexander Morozevich 2787, Dmitry Jakovenko 2737, Peter Svidler 2727, Evgeny Alekseev 2715, Artiom Timofeev 2670, Ernesto Inarkiev 2669, Alexander Riazantsev 2656, Alexander Lastin 2651, Evgeny Tomashevsky 2646, Konstantin Sakaev 2640, Nikita Vitiugov 2638, Konstantin Maslak 2544. Time raiting was 1 hour 40 minutes for 40 moves, then 50 minutes for 20 moves and 10 minutes till the end of the game with an increment of 30 seconds per each move. It is forbidden to offer a draw. In case of tie the 1st place will take place a match (or match-tournament) in rapid chess. The prize fund is 5 million rubles (about 200.000 USD). The prize for the 1st place is 1.100.000 rubles, 2nd place is 800.000 rubles, 3rd place is 650.000 rubles etc. Hikaru Nakamura won the Cap d'Agde tournament, which took place 26th October - 1st November in France. As usually there was a closed rapid tournament divided in 2 groups, than 1/4 finals, 1/2 finals and final. Participants were: Vasily Ivanchuk UKR GM 2786, Magnus Carlsen NOR GM 2786, Teimour Radjabov AZE GM 2751, Maxime Vachier Lagrave FRA GM 2716, Bu Xiangzhi CHN GM 2714, Hikaru Nakamura USA GM 2704, Ivan Cheparinov BUL GM 2696, Anatoly Karpov RUS GM 2651, Fabiano Caruana ITA GM 2640, Humpy Koneru IND GM 2618, Hou Yifan CHN WGM 2578, Marie Sebag FRA GM 2533, Sebastien Feller FRA GM 2526, Alexandra Kosteniuk RUS GM 2525, Katerina Lahno UKR GM 2488, Almira Skripchenko FRA WGM 2455. The teams "Ural" from Russia (Radjabov, Kamsky, Shirov, Grischuk, Malakhov, Motylev, Dreev, Rashkovsky) and "Cercle d'Echecs" from Monte Carlo (Koneru, Cramling, Xie Jun, Dzagnidze, Socko, Skripchenko) become the winners of the European Club Cup 2008 for Men and Women which took place in Kallithea, Greece 16th-24th October. Match in classical chess between men ended with the score 10.5:14.5 in favor of China, between women with 13.5:11.5 in favor of Russia. In rapid chess Russia won 13:7 (match points - 28-22). The women tied 10:10 in match points and 25:25 - on individual results. In the blitz-match Chinese men - Russian men 14:6 and Russian women - Chinese women 11:9. Veselin Topalov won the Chess Grand Slam Final. The event took place in Bilbao 1st-13th September The players were: Levon Aronian, Viswanathan Anand, Vassily Ivanchuk, Magnus Carlsen, Veselin Topalov, Teimour Radjabov. Alexandra Kosteniuk is the new World Champion! Our congratulationbs! The World Women's Championship 2008 took place in Nalchik (Russia) 28th August - 18th September with a prize fund of 450,000 USD. Participants: Koneru Humpy IND 2622, Hou Yifan CHN 2557, Cramling Pia SWE 2554, Stefanova Antoaneta BUL 2550, Sebag Marie FRA 2529, Zhao Xue CHN 2522, Kosintseva Tatjana RUS 2511, Kosteniuk Alexandra RUS 2510, Cmilyte Viktorija LTU 2508, Muzychuk Anna SLO 2504, Ruan Lufei CHN 2499, Zhukova Natalia UKR 2489, Chiburdanidze Maya GEO 2489, Hoang Thanh Trang HUN 2487, Xu Yuhua CHN 2483, Paehtz Elisabeth GER 2481, Ushenina Anna UKR 2476, Socko Monika POL 2473, Krush Irina USA 2470, Gaponenko Inna UKR 2468, Javakhishvili Lela GEO 2461, Harika Dronavalli IND 2461, Kosintseva Nadezhda RUS 2460, Korbut Ekaterina RUS 2459, Zatonskih Anna USA 2446, Shen Yang CHN 2445, Mkrtchian Lilit ARM 2436, Tania Sachdev IND 2432, Bojkovic Natasa SRB 2423, Rajlich Iweta POL 2417, Lomineishvili Maia GEO 2414, Khurtsidze Nino GEO 2413, Matveeva Svetlana RUS 2412, Khukhashvili Sopiko	GEO 2408, Mongontuul Bathuyang MGL 2406, Ju Wenjun CHN 2389, Tan Zongyi CHN 2387, Moser Eva AUT 2383, Kachiani-Gersinska Ketino GER 2374, Bosboom Lanchava Tea NED 2358, Gvetadze Sopio GEO 2355, Mohota Nisha IND 2354, Nebolsina Vera RUS 2350, Amura Claudia ARG 2345, Zhang Jilin CHN 2344, Sedina Elena ITA 2344, Foisor Sabina-Francesca ROM 2337, Le Thanh Tu VIE 2325, Kadimova Ilaha AZE 2324, Arribas Robaina Maritza CUB 2323, Nguyen Thi Thanh An VIE 2323 , Rohonyan Katherine USA 2321, Zakurdjaeva Irina RUS 2308, Velcheva Maria BUL 2281, Golubenko Valentina CRO 2271, Pourkashiyan Atousa IRI 2269, Muminova Nafisa UZB 2242, Zuriel Marisa ARG 2231, Gasik Anna POL 2211, Sanchez Castillo Sarai VEN 2202, Zapata Karen PER 2180, Khaled Mona EGY 2007, Alaa El Din Yorsa EGY 1959, Solomons Anzel RSA 1895. A number of players have chosen not to participate. These include all the Georgian players (Maia Chiburdanidze, Lela Javakhishvili, Sopio Gvetadze, Maia Lomineishvili, Sopiko Khukhashvili and Nino Khurtsidze), Tea Bosboom Lanchava, Karen Zapata, Marie Sebag and Irina Krush. Also Ekaterina Korbut didn't play in the 1st round. All of them lost by default in the first round. In the Final match Alexandra Kosteniuk and Hou Yifan will play 4 classical games, then in case of a draw score 2 rapid games, then 2 blitz games and at last a sudden death game. Koneru Humpy and Aleksandra Kosteniuk won their matches by default. Xu Yuhua, Koneru Humpy, Hou Yifan, Stefanova, Cramling, Gasik, Zhao Xue, Kosintseva Tatjana, Kosteniuk, Chmilyte, Muzychuk, Ruan, Nguyen Thi Thanh An, Hoang Thanh Trang, Ushenina, Sedina, Gaponenko, Amura, Harika, Kosintseva Nadezhda, Zatonskih, Shen Yang, Tan Zongyi, Mongontuul, Matveeva. Rohonyan, Paehtz, Socko, Mkrtchian, Ju Wenjun. Vassily Ivanchuk won the Tal Memorial. The event took place in Moscow 17th-31st August. The players were: Vladimir Kramnik, Alexander Morozevich, Evgeny Alekseev, Vassily Ivanchuk, Alexei Shirov, Gata Kamsky, Ruslan Ponomariov, Shakhriyar Mamedyarov, Peter Leko and Boris Gelfand. A blitz tournament took place after the main event (29th-30th August) with qualfiers on the 27th and 28th and the invitees Anatoly Karpov and Magnus Carlsen. Vassily Ivanchuk become the winner also in this tournament. Etienne Bacrot become the France Champion. The French Championship took place in Pau 11th-23rd August 2008. Participants: Bacrot Etienne g FRA 2691, Vachier-Lagrave Maxime g FRA 2681, Fressinet Laurent g FRA 2673, Bauer Christian g FRA	2583, Sokolov Andrei g FRA 2561, Maze Sebastien g FRA 2553, Vaisser Anatoly	g FRA 2542, Nataf Igor-Alexandre g FRA 2534, Degraeve Jean-Marc g FRA 2523, Feller Sebastien g FRA 2523, Apicella Manuel g FRA 2521, Abergel Thal m	FRA 2499. Levon Aronian won the 2nd FIDE Grand Prix Tournament, which took place in Sochi 31st July - 14th August. Participants: Ivanchuk Vassily UKR 2781, Radjabov Teimour AZE 2744, Svidler Peter RUS 2738, Aronian	Levon ARM 2737, Grischuk Alexander RUS 2728, Karjakin Sergey UKR 2727, Kamsky Gata USA	2723, Gelfand Boris ISR	2720, Gashimov Vugar AZE 2717, Jakovenko Dmitry	RUS 2709, Wang Yue CHN 2704, Cheparinov Ivan BUL 2687, Navara David CZE 2646, Al Modiakhi	Mohamad	QTR 2556. Michael Adams became the winner of the Staunton Memorial, which took place in London August 7th-18th. Participants: Adams Michael g	ENG 2735, Sokolov Ivan g NED 2658, Short Nigel g ENG 2655, Van Wely Loek g NED 2644, L'Ami Erwin g NED 2610, Smeets Jan g NED 2593, Werle Jan g NED 2591, Timman Jan g NED 2562, Wells Peter g ENG 2526, Speelman Jon g ENG 2524, Cherniaev Alexander g RUS 2431, Wade Robert m ENG 2167. Vishvanatan Anand won The Rapid Chess Mainz which took place 1st-3rd August. There was a double round robin amongst Viswanathan Anand, Alexander Morozevich, Magnus Carlsen and Judit Polgar. The time rate was 20min + 5 seconds a move. Jan Nepomniachtchi become the winner of The Ordix Chess Mainz which took place 2nd-3rd August. The time rate was also 20min + 5 seconds a move. Veselin Topalov took clear first place with 8/9 at the XXIII Villarrobledo International Rapid Open which took place over the weekend of 2nd-3rd August. Evgeny Alekseev became the winner of the 41st Biel International Chess Festival after a playoff vs Leinier Dominguez 2.5:1.5. The event took place 19th July - 1st August. Participants: Magnus Carlsen NOR 2775, Evgeny Alekseev RUS 2708, Leinier Dominguez CUB 2708, Etienne Bacrot FRA 2691, Alexander Onischuk USA	2670, Yannick Pelletier	SUI 2569. The 71st Corus Chess tournament will take place Friday, January 16th to Sunday, February 1st, 2009 in Wijk aan Zee, The Netherlands. As usually will be 3 groups: A, B and C.
Group A participants: Alexander Morozevich RUS 2 (world rank) 2787 (born 1977), Vassily Ivanchuk UKR 3 2786 (1969), Magnus Carlsen NOR 4 2786 (1990), Levon Aronian ARM 7 2757 (1982), Teimour Radjabov AZE 8 2751 (1987), Wang Yue CHN 11 2736 (1987), Michael Adams ENG 12 2734 (1971), Sergei Movsesian SLW 13 2732 (1978), Sergei Karjakin UKR 15 2730 (1990), Gata Kamsky USA 16 2729 (1974), Leinier Dominguez CUB 21 2719 (1983), Loek van Wely NED 2618 (1972), Daniel Stellwagen NED 2605 (1987), Jan Smeets NED 2604 (1985). Levon Aronian became the winner of the 17th Amber Rapid and Blindfold Chess Tournament took place March 14th-28th in Nice. The participants were: Kramnik Vladimir RUS (born 1975) 2799, Anand Viswanathan IND 1969 2799, Topalov Veselin BUL 1975 2780, Morozevich Alexander RUS 1977 2765, Mamedyarov Shakhriyaz AZE 1985 2760, Leko Peter HUN 1979 2753, Ivanchuk Vassily UKR 1969 2751, Aronian Levon ARM 1982 2739, Gelfand Boris ISR 1968 2737, Carlsen Magnus NOR 1990 2733, Karjakin Sergey UKR 1990 2732, Van Wely Loek NED 1972 2681. Sanan Sjugirov and Anastasia Bodnaruk became the Champions of Russia under 20. They got rights to participate in the World Championships u20. The Championships of Russia among boys and girls u20 took place in Saint-Petersburg 8th-18th March. Time control: 1 hour 30 min. for 40 moves, 30 min. till the end of the game with an increment of 30 sec. per move since the first. The players who took 2nd places in the tournaments got rights to participate in the European Championship. Shahcom Company provided live coverage of games in the playing hall and via Internet. The participants of the boys tournament: Popov Ivan born 1990 g 2595 Moscow, Andreikin Dmitry 1990 g 2573 Saratov, Romanov Evgeny 1988 g 2543 Chelyabinsk region, Rakhmanov Alexander 1989 g 2524 Vologda region, Nechepurenko Roman 1988 f 2495 Ufa, Ponkratov Pavel 1988 m 2489 Chelyabinsk, Papin Vasily 1988 m 2475 Rostov region, Chadaev Nikolai 1988 m 2471 Moscow, Lovkov Roman 1988 f 2457 Saint-Petersburg, Linchevsky Daniil 1990 m 2440	Leningrad region, Shimanov Alexander 1992 m 2441 Saint-Petersburg, Sjugirov Sanan 1993 m 2491 Lipetsk region. The participants of the girls tournament: Charochkina Daria 1990 wm 2383 Moscow, Vasilkova Svetlana 1988 wm 2359 Moscow, Girya Olga 1991 wf 2342 Moscow, Gunina Valentina 1989 wf 2295 Moscow, Bodnaruk Anastasia 1992 wf 2317 Moscow, Tarasova Viktoria 1989 wm 2267 Saratov, Ivakhinova Inna 1989 wm 2250 Ulan-Ude, Ambartsumova Karina 1989 wf 2228 Moscow, Severiukhina Zoja 1990 wf 2199 Izhevsk, Meleshko Anna 1989 wm 2215 Primorsk region, Shlakich Anna 1991 2244 Saint-Petersburg, Savina Anastasia 1992 2202 Moscow. The chess festival "Young hopes of the North-West" took place in Kirishi (Leningrad region) 23d-25th February. Participants: Kirill Alekseenko (born 1997) - silver medallist of Russian Championship under 10, Championship of Europe 2007, Maria Butuc (1993) - Champion of Russia 2007 under 14, Alexander Ganichev (1994) - silver medalist of NW Russian region between boys under 12-14, Vadim Pischikov (1994) - winner of the Leningrad region Cup, Evgeny Polonovsky (1994) - Champion of NW region of Russia under 12, Champion of Leningrad region under 10-14, Vladimir Smirnov (1994) - Champion of Kirishi under 14. During the festival took place: the rapid chess tournament (23.02), classical chess tournament "Participants against computers" (23.02), round robin tournament "Chess 960" (24.02), sheveningen tournament between participants and local team club "Kinef" (25.02), simults by GM Evgeny Alekseev against participants of Festival and GM Konstantin Sakaev against local chess club "Gambit". Shahcom Company provided live coverage of the games of the rapid chess and "Chess 960" (Fischer chess) tournaments in the playing hall and via Internet. Maria Butuc is the winner of this competition. 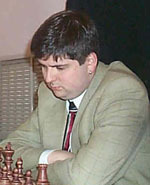 Kirill Alekseenko became the winner of the tournament. Produced by Shahcom Company and the best St-Petersburg chessplayers. Shahcom Company, © 2003. All rights reserved.